Evan and Alyssa, who met at work, became man and wife on April 8, 2018. 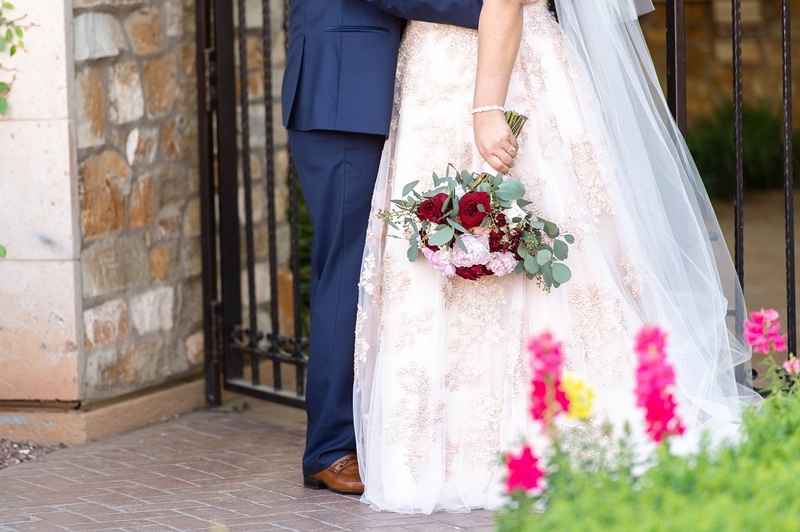 Alyssa selected a romantic blush-colored strapless gown with an illusion sweetheart neckline, an embellished bodice, and gold appliques on the skirt. Her bouquet featured red, white, and pink flowers accented with eucalyptus. Her four bridesmaids wore coordinating full-length burgundy gowns. 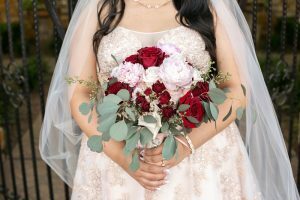 They carried smaller versions of the bride’s bouquet. Evan looked handsome in a dark blue tuxedo with a dark blue vest, white shirt, gold tie, gold pocket square, and mini bouquet boutonniere. 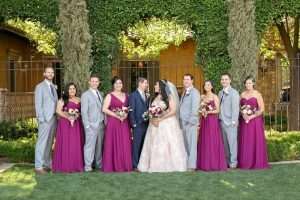 His four groomsmen wore light gray three-piece suits with white shirts, purple patterned ties, burgundy pocket squares, and mini bouquet boutonnieres. 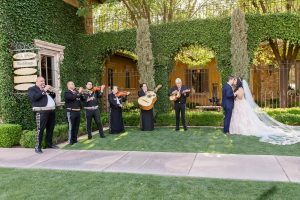 In the ceremony, the couple lit a unity candle to signify their new marriage. At the reception, guests enjoyed a meal that included Caesar salad, penne pasta with peppers, pesto pasta, chicken, vegetables, and bread. During the speeches, the maid of honor, one of the bride’s sisters, talked about how Alyssa has always been there for her, and how Evan has been generous with his heart toward his new bride. The best man, the groom’s brother, told Alyssa that he was thrilled to have her as a sister. 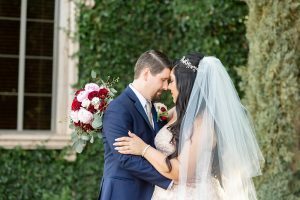 The bride’s parents thanked Evan for treating Alyssa so well, and welcomed him to their family. The groom’s parents shared their happiness about the wedding and said they looked forward to Alyssa being a part of their family. Alyssa and Evan danced for the first time as a married couple to “Never Stop” by SafetySuit. Alyssa and her father danced to “I Loved Her First” by Heartland. Evan and his mother danced to “A Song for Mama” by Boyz II Men. The three tier wedding cake featured a base tier inscribed with the words “And They Lived Happily Ever After”; top and middle layers done in blush with a brush effect; blush and burgundy rose accents, and a cake topper featuring the couple’s last initial. The newlyweds left their wedding under the signature sparkler send-off, and honeymooned in Hawaii.We wish the bride and groom a long life full of love and joy! 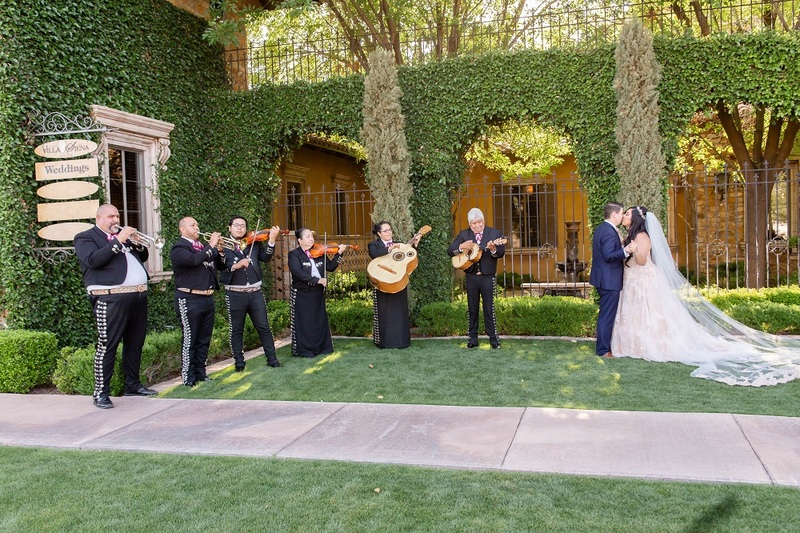 To see more photos from this wedding, visit our Photo Gallery.